Home / Life at the Manor / Let us have some pictures! Oh my god, you guys. There is nothing cuter than baby chickens first thing int he morning. Anyway, here we go. Pics! Baby silkies! I am starting to be able to tell them apart. They will be hilarious balls of floof even as adults. I have decided to name them after the seven demons who were associated with the seven deadly sins: Lucifer, Mammon, Asmodeus, Leviathan, Beelzebub, Amon, and Belphegor. 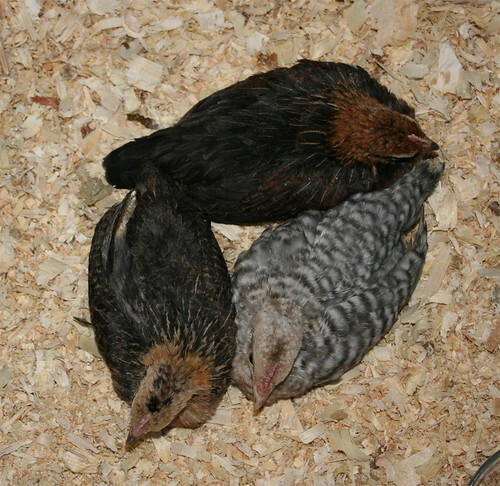 The two brown ones are a color called “partridge” and the other color is called “crele”. It’s really gorgeous, the stripes are grey on his back but brown on his breast. Anyway, the darkest partridge one is Annaham, and the crele one is Merlin. The adults are outside enjoying Bantytown. First up, the King of Bantytown — when we turned everyone loose, he immediately went and intimidated everyone else into admitting he was top roo. 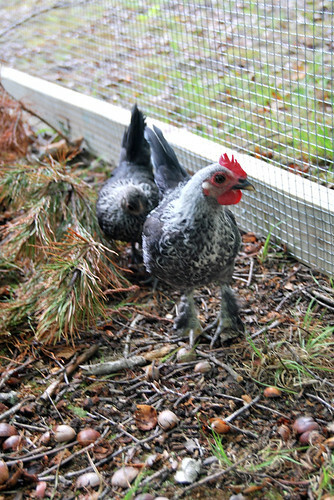 The King and his Queen, who are Mystery Chickens I bought as a pair. The King is feather-legged and the color pattern doesn’t match anything I’ve read about, and also I forgot to take notes when I bought them. I picked them up because every time I stopped at their cage at the swap, the King made eyes at me. Anyway, we’re pretty sure they are Arthur and Guenivere. 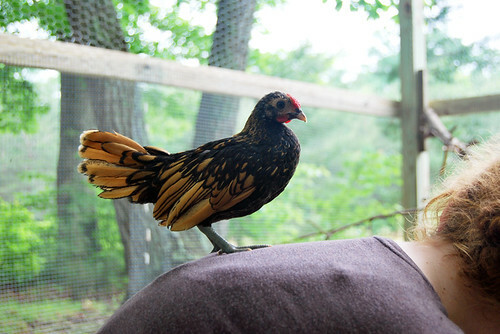 This is Galahad, a gold-laced Sebright roo. As you can see, he is very friendly and not at all alarmed about human beings. The girl in front with the stars on her feathers is Morgan le Fay, behind her is Isolde, preening. 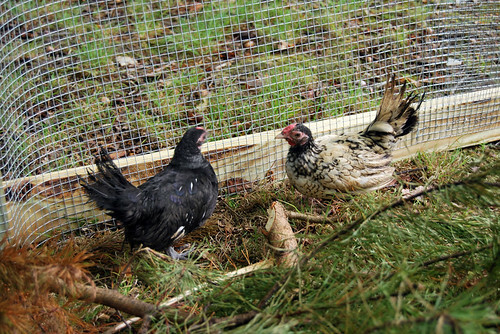 Morgan is a purebred Serama hen, Isolde is a Sebright/Serama cross. Percival on the left, Tristan on the right. 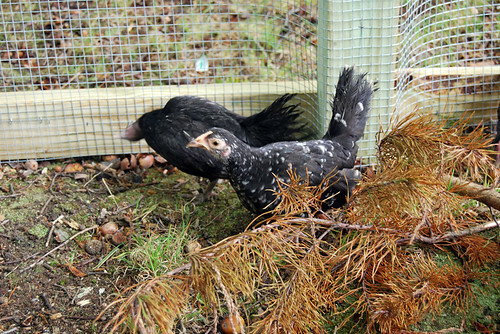 They’re both young Sebright/Serama crosses. Isn’t he fantastic? Mad Mel the Magnificent is a Showgirl roo. 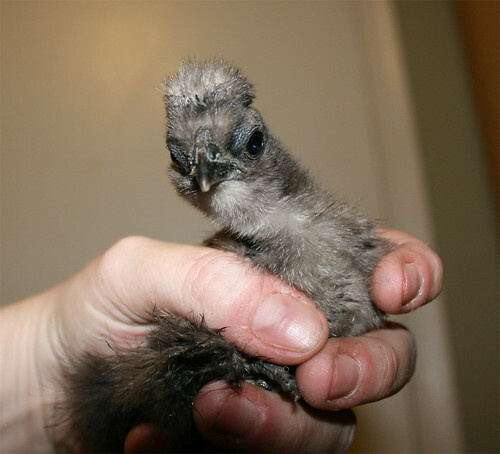 Showgirls are a cross between silkies and naked-neck Turkens. I have desperately wanted one since I found out they existed. 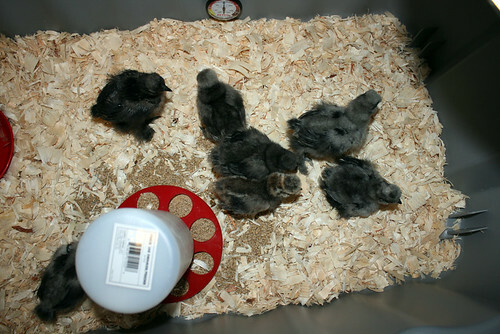 I may get him a large silkie hen or two later, but for now he’s in with Lorena, Matilda, Bebelina, and Ayinnanku. It’s Monday morning, that must mean it’s time for chicken pictures.